"Inasegawa Seizoroi (Five Dandy Thieves at the Inase River)" Scene from "Aotozoshi Hana No Nishikie"
wrongdoings throughout the country, were finally surrounded by a band of thief-takers (a posse of people officially hired to capture criminals). Resigned to their fate of getting caught, the five men declare their true identities and in turn tell their life stories. the Edo period through to the Meiji era. called Shiranami in ancient China. 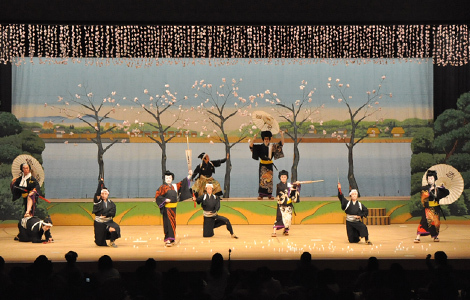 Due to this, kabuki dramas that depict thieves are often called “Shiranami mono”. 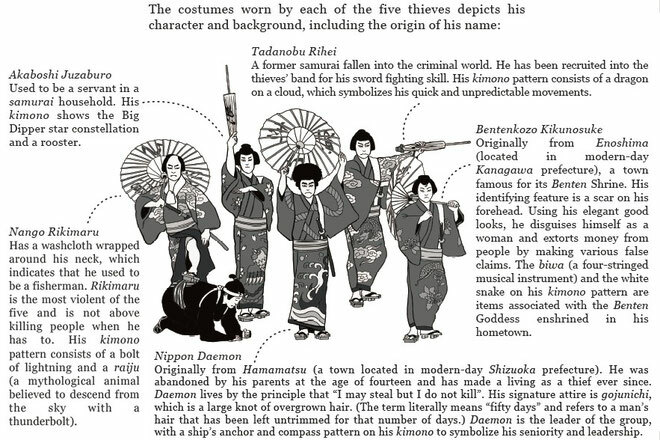 ・Watch the colorful and flashy costumes of the five thieves, each symbolizing the character being played.